Help highly needed with MAN B&W ME-series engines black deposits on cylinder liner walls. Any ideas? Jan. 14, 2017, 1:54 p.m.
Jan. 14, 2017, 2:03 p.m.
During the initial testbed running, when the so-called 'breakingin' of the cylinder occurs, the cylinder oil feed rate is very high compared with the normal condition. This higher feed rate gives a lot of excess calcium carbonate (and less calcium sulphate due to the lack of sulphur), which is deposited on the piston crown. A drain oil analysis is also a strong tool for judging the engine wear condition. 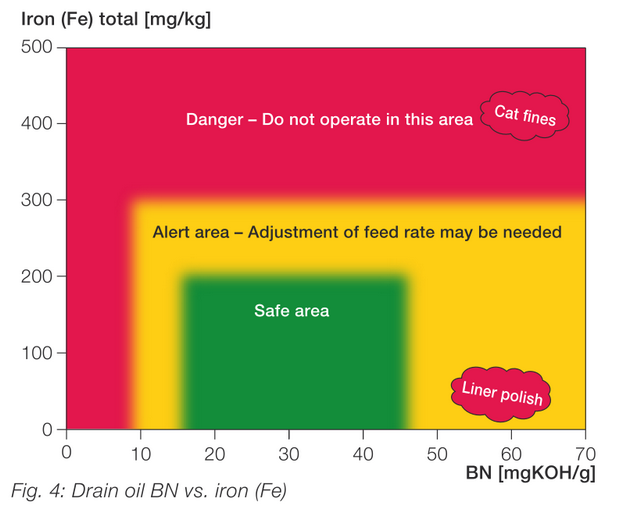 Drain oil samples taken in active ACC operation will show if the oil feed rate can be optimised while keeping the BN between 10-25 mgKOH/kg and the iron (Fe) content below 200-300 mg/kg in the drain oil. Jan. 14, 2017, 2:15 p.m.